CRU: Is There a Cancer-Cholesterol Connection? Cholesterol is in the news lately with a report that the expert advisory committee for the 2015 Dietary Guidelines will do away with restrictions on dietary cholesterol, a longstanding guideline for heart health. So how does dietary cholesterol affect cancer risk? If the committee's recommendation to change advice on dietary cholesterol becomes part of the guidelines, that advice can also align with a cancer protective diet. Cholesterol is a fat-like substance that our cells manufacture and use for structure, and to make vitamin D, certain hormones and bile acids that are important for digestion. We can make all the cholesterol our bodies need, but we also get cholesterol from our diet. Cholesterol is carried through the bloodstream packaged with proteins. Those packages are called lipoproteins. There are several types of LDL (low-density lipoproteins) and HDL (high density lipoprotein). Both are important, but too much LDL in our blood can cause plaque to form in arteries, leading to blockage, which increases risk for heart disease. Dietary cholesterol can only come from meat, milk and other animal foods. 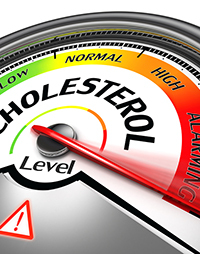 Research has not shown a link between dietary cholesterol and cancer risk. Yet while dietary cholesterol may not have a direct effect on cancer risk, a diet high in cholesterol often includes high amounts of foods that could affect cancer risk. Red and Processed Meats: Evidence shows that consuming high amounts of red meat increases the risk for colorectal cancer. Eating any amount of processed meats regularly also increases the risk. Research is clear that eating a diet with mostly plant foods and small amounts of animal foods keeps risk lower for many common cancers. Milk, cheese and other dairy products and their link to cancer risk is mixed. Milk and diets high in calcium link to a lower risk for colorectal cancer, but there are indications of links between diets high in calcium and increased risk for prostate cancer. AICR does not make a recommendation on milk and dairy foods and cancer prevention. Butter, Cheese and Baked Goods: Pastries and baked goods with added butter and cheese are high in cholesterol, and often high in fat. AICR recommends limiting foods high in energy density, which include foods high in fat. In addition to the saturated fat, these foods tend to be high in calories and that can lead to weight gain and obesity. Excess body fat links to increased risk of nine cancers, including colorectal, postmenopausal breast and endometrial. There is room in a cancer-protective diet for high cholesterol foods, including eggs, shrimp and other seafood, low fat dairy products, and moderate amounts of lean red meat. Moderate amounts of dairy foods provide bone building calcium and potassium, which can help keep blood pressure at healthy levels. Eggs are inexpensive and packed with protein. Keeping one-third or less of your plate for animal foods is an easy way to think about a plant-based diet that allows for some meat, milk and eggs. If the recommendation to restrict dietary cholesterol is dropped, this fits with the new way health professionals and scientists are thinking of nutrition advice. Rather than focusing on specific nutrients or compounds, like cholesterol, many nutrition researchers are focusing on dietary patterns to understand how what we eat affects health and disease risk. Singling out the role of specific nutrients, like cholesterol, fat, protein, fiber or vitamins, provides only one piece of the dietary puzzle. Because we eat a variety of foods and not just nutrients, all the substances in those foods interact in our body in complex ways to affect health. Evidence is mounting that a variety of plant-focused eating patterns are cancer fighting and promote overall health. These diets include plenty of vegetables, fruit, whole grains, legumes and nuts and they also lower risk for type 2 diabetes and cardiovascular disease. For more on eating patterns for cancer prevention, watch AICR’s recorded webinar, Eating Patterns to Lower Cancer Risk: More than One Route to a Plant-Based Diet.